ECSU’s Military and Veterans Affair Center director, Tim Freeman, left, announced the opening of a food pantry located in the facility’s Griffin Hall office. The pantry will assist members of the Coast Guard effected by the current partial government shutdown. 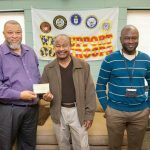 ECSU alumni and Elizabeth City businessman, Billy Joe Reid, center, donated $1,000 to the pantry. Joining Freeman and Reid is Veterans Affairs representative Jamal Blyther. 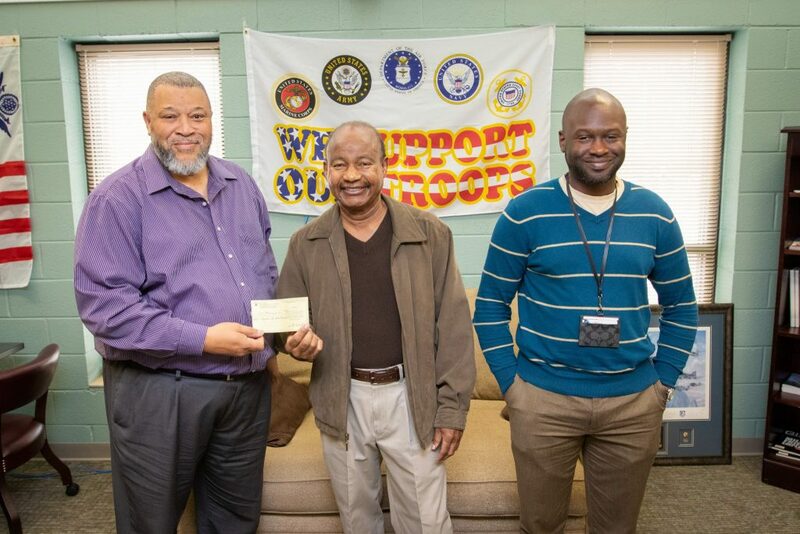 Elizabeth City State University is looking out for its partners in the U.S. Coast Guard with the opening of a food pantry inside the campus’s Military and Veterans Affairs Center. According to the ECSU director of Military and Veterans Office, Tim Freeman, the men and women of the Coast Guard now have a place on campus to receive food assistance during the ongoing partial government shutdown. During the shutdown, Coast Guard members are working without pay and community organizations such as ECSU are stepping up to the plate to assist them. “We’re going to have the food pantry open to the military every day,” said Freeman. The pantry began operating full time on Thursday, Jan. 24. Freeman says it will be open to members of the military during regular business hours, 9 a.m. to 4 p.m., Monday through Friday. In a letter to the Elizabeth City Coast Guard base executive officer, Cmdr. Warren Judge, ECSU Chancellor Karrie Dixon expressed her appreciation for the work of the service men and women stationed in the community. On Thursday, Elizabeth City businessman Bill Joe Reid, donated $1,000 to help purchase food for the pantry. Reid is a 1970 ECSU graduate, a State Farm Insurance agent, and active community member. “We’re grateful to Mr. Reid for working with us to help our neighbors at the Coast Guard base,” said Freeman. The Military and Veterans Center food pantry is operating in cooperation with ECSU’s Viking Cares Food Pantry, located at the Vaughan Center. ECSU director of community engagement, Russ Haddad, said the Military and Veterans food pantry is operating as a satellite location for the Viking Cares Food Pantry, which is a member of Food Bank of the Albemarle. Under the direction of kinesiology professor, Dr. Jennifer Brown, ECSU students operate the Viking Cares Food Pantry to assist fellow students, and now Coast Guard members, with food needs. Since the Viking Cares Food Pantry opened last spring, numerous students have received needed help with monthly groceries. In addition to students, the pantry has also assisted the local chapter of the American Red Cross with its needs, supplying food to families hit hard by last year’s hurricane season. The ECSU Military and Veterans Affairs Office has been in operation since 2015 but recently moved to its permanent home in Griffin Hall. Freeman says the office provides assistance to active and retired military members and their spouses with education opportunities, and veterans’ needs.